Published at almost the same time as A Scott Berg’s materful biography of Lindbergh, a sweetly moving memoir of growing up as the daughter of Charles and Anne Morrow Lindbergh. The novelist (The Names of the Mountains, 1992, etc.) 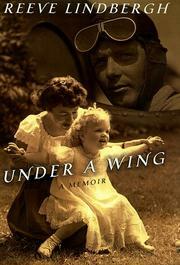 is the youngest of five Lindbergh children, all born after the tragic kidnapping of the famous couple’s first-born son. Few knew the Lindberghs had such a large family, and that was how the family wanted to keep it. To escape publicity, they moved frequently, finally settling in an old stone house in Connecticut, where Reeve grew up after WWII. Her father traveled habitually, consulting for government and industry, but was a devoted—if domineering—parent when home, exercising “affection and discipline in equal measure, often at the same time.” Her mother was a quieter, less controlling presence; she wished to “heal, soothe, and uplift us.” Although Reeve learned little of her kidnapped brother, eventually she too lost a son when he was not yet two years old. Her mother sat with her by the little boy’s body, and together they mourned the lost babies. After Charles Lindbergh died nearly 25 years ago, Reeve sought him out again in his boyhood home in Little Falls, Minn., now a state park site. She reflected there on how to reconcile public and private images of famous parents, as well as on the man who taught his children that intolerance was “repellent and unspeakable”—yet who himself wrote and uttered anti-Semitic statements. Anne Lindbergh, now in her 90s, suffering from the aftereffects of stroke, often doesn’t recognize her daughter. Reeve writes about her mother’s illness with sorrow, anger, humor, and acceptance. She also remembers her grandmothers, her siblings—especially her sister, who died of cancer five years ago—and pleasant summers in Maine. An eloquent recollection of a happy childhood in a tightly knit family whose parents’ celebrity complicated but did not contort their lives.